"The Sister Circles have been the most pivotal part of the past year of my life, enriching my life in ways I could never have imagined. There is a magical alchemy that occurs when women come together in their truth. To sit in honour, compassion, love, support and understanding, The Sister Circles are a bliss bubble of incandescent heart energy. Sitting in circle is an indescribable gift and honour. They have been my safe haven, the place where I have been gifted the opportunity to feel and just be. It is through the power of circles, this place to be raw and vulnerable, that I have been able to experience true evolution, always sublimely encased in the comfort and love of sisters." "Kate creates a beautiful, warm and safe space for exploring the Self. She brings a wealth of knowledge and experience to the group and leads with humour, grace and humility. I can highly recommend her Sister Circles and look forward to the next one." "The Sister Circles' for me, were profoundly life enriching. I found myself entering the space with hesitation and uncertainty, but each time leaving the room with an overflowing heart, nourished by the supportive wisdom that all sisters placed forward. I learned that sitting and sharing openly in a space with loving women is deeply healing, far beyond therapy, as we can all relate to one~another and have the power to ignite each~others wild woman and compassionate hearts. In the 5 weeks I sat for circle a transformation occurred, this transformation called for the safe space and comforting guidance of the 'SisterCircles', to be able to effectively and fully unfold. I am deeply grateful for this love-enhancing experience and I know 'The Sister Circles' are now a rich part of my sacred life journey as a young woman. Kate is unlocking the door and sharing the key with all sisters who are ready to re-enter the miraculous realms of their most inner world. It is here where deep seeded wisdom swirls softly and sacred knowledge sings gently; Empowered by Kate's SisterCircles our united spirits can move freely allowing the sisterhood to awaken in the hearts of all women. So again, we can dance wildly on the breath of creation. Thank~you to Kate and thank~you to all Sisters x"
Rheanna ~ Writer, Student, Nanny, Lover of the Sisterhood! "I had the absolute pleasure of sitting in a 5 weeks Sister Circle and found it to be one of the most truly inspirational, soul changing, heart opening, strengthening and incredibly bonding experiences I have ever done. It has helped me beyond measure: I am forever grateful and wish for all of my sisters to be open and able to receive this gift." There is a soulful chemistry that occurs when women come together in their raw, divine vulnerability. With Kate's sublime wisdom and guidance we sit and majestically weave together the tapestry of our individual energies, guiding us to become a vibrant circle of luscious love and support. A truly healing space of the purest hearts and encouragement, nothing can compare to the power of Sister Circles. "I joined The Sister's Circle with the intention to sit a round in support of Kate - who I've always admired and respected. I really had no idea what I was signing up for! Now, at the end of a five week cycle I've got a group of women in my life who's support I feel always and something I do every week that is just for me. There's an indescribable magic and energy that happens when a group of women come together, listen to one another without interruption and respond in love. This magic somehow filters through the rest of the areas of your life and I've become stronger as a result. I've been able to share, be heard and be honoured in a way that could only be done by the feminine...and I believe in sisterhood again. . Thank you Kate for your softness and strength. You are a medicine woman in more ways than you'll ever know and we are blessed by what you have created just by being that amazing reflection of Source that you are." "Thank you again for an insightful day. I think it was a special day spent on oneself that you never get to do. I enjoyed all parts of it, I liked how it combined a bit of spirituality with psychology in a nurturing environment. I was surprised how much you do end up opening up about and it is wonderful to realise that everyone has some sort of thing going on. I think you do an amazing job of listening and giving advice and making everyone feel relaxed. I loved that it was women caring and sharing with other women." "I could never of imagined the power of having women together in a Circle. It was a nourishing, enriching and very supportive space. Exactly what i needed whilst faced with some challenging decisions in my life. I gained more clarity, strength and felt empowered. These women quickly became my sisters." 'Having been involved in Sister Circles in the past, I was very aware of the amazing power of women, deeply sharing wisdom to support each other in a safe space as they share experiences with each other. The healing occurs in front of you. The Sister Circle Facilitator Training program interested me, as I kept speaking to women and men who were interested in sharing circles, and I also felt it would be beneficial in supporting colleagues in my work place. The program was so well thought out, I was coached through the process and supported in holding my first workshop, all while completing the training. Kate was wonderful in holding space for the participant, even over a computer screen, it was amazing. It has also assisted me in communicating better with my colleagues at work, and in my personal life, to really stop and listen to what they are saying, instead of listening to reply. I can already see this process empowering my colleagues at work as we co create in making positive changes in our workplace. Thank you for sharing these tools Kate, I am so very grateful." "I have sat in many women's circles over the years and never have I felt such professionalism and integrity as in the space held by Kate. Kate's Sister Circles offer a safe and grounded forum to really check in with yourself and truly be heard. I was reminded of the power and transformative quality of simply sharing and acknowledging. Thank you Kate and to all of my sisters for being my witness." "Participating in a sister circle is like fuel for the soul. Kate's ability to really "see" the women in her circle for their individuality, uniqueness of circumstances and nature is one of her more special talents. Kate does this whilst nurturing everyone collectively so they can bond together and share in the healing power of women respectfully and authentically. Kate skillfully and inclusively encourages the co-creation of women's intuitive wisdom to gather and be expressed for the benefit of all lucky enough to experience the gift of attending a Sister Circle. Clearly I couldn't recommend her highly enough as a genuine and committed spiritual healer and facilitator." "The Sister Circles workshop opened up both my heart and mind & it helped me to understand myself at a deeper level. Kate has is a gifted healer & facilitator who holds your heart in her hands with great care & empathy." "I just want to say that I am beyond grateful for whatever mysterious starlight guided me to this Circle. I don't feel it was by chance. I was putting the call out for 'something more'. I wanted to connect deeply with others, to know myself more intimately, to be raw, real and vulnerable. To live wholeheartedly. As the world speeds up and gets busier, it seems connections become more and more abstract and diffuse. I build relationships off foundations of fleeting interaction. Sensing, or more so knowing, there's more to that person... if only I had time... time to listen... time to share... time to actually peel back the layers. Poverty of presence, time and true connection is a cultural condition of our time. This Sister Circle is the antidote. Amongst a daily whirlwind of appointments, routines, to-do's and should-do's this Circle was a true refuge. A sacred container where I could come undone. Where I'd be held so tightly by the collective that all those tiny pieces of my heart would be put back together before the night was done. Over the 5 weeks, I felt a lightness of being. I felt deeply connected to others. I felt held, nourished and supported. Life itself felt more expansive. There is something powerful about women coming together with the intent to support and empower each other. These circles leave a light on, they're a beacon of hope in the darker seasons of our lives, and extra radiance when things are rad. One day they will be available and accessible to all women. Kate is fanning the flames. Watch them spread like wild fire. Go get 'em Goddess!" "Kate is simply on purpose. In the Sister Circles her heart shines and supports as she holds space with a love that is true, caring and real. Kate's vision is essential on this planet and anyone who takes the time to be part of one will walk away with a deeper understanding of self, togetherness and the power of sharing, listening and being vulnerable. I feel the Sister Circles are essential for all woman who are willing to be all of who they truly are." Although I had attended a number of different women's circles none had grabbed me the way Kate's did, so I decided to take the plunge and do the Facilitator Training. Kate's circles are truly magical and her way of teaching is no different. She teaches in such a way that you can only succeed as you feel completely supported by the energy of the sisters no matter where in the world you are. 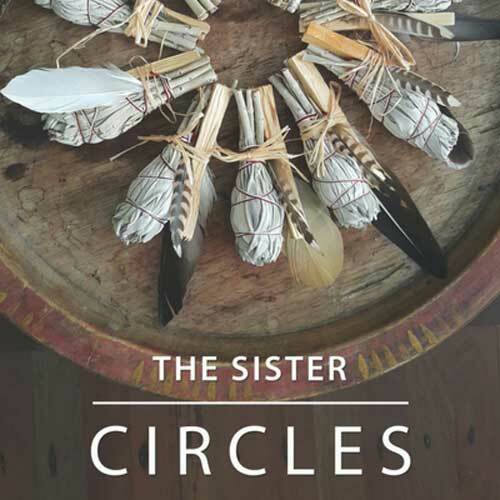 I had never run any type of circle or workshop before, but within a few weeks of completing the course I held my first Sister Circle - due to my inexperience I just followed all Kate's recommendations and it was an overwhelming success. "I had heard of circles before and indeed had been guided to join this one. Yet none of what I had heard and read held a clue as to the unfolding that would occur. The Sister CIrcle broke me open. It laid bare my deep longing to be seen. To be heard. To be held in a space of love without judgement, and without expectation. And when I felt broken, the circle held me together. The power of the Circle and its effect was in large part due to the loving energy Kate brought each week. Even through a computer screen I felt her loving wisdom, gentleness and compassion. The Circle is an ancient art which underpins the connection all women need. And we need each other more than ever now. It allows us to connect and support each other through shared experience. It’s like a warm balm for our wounds that allows the healing to begin with sweetness and light." "The Sister Circles have touched a piece of my soul that is connected to each and every woman across all time. For me they have strengthened the invisible thread that binds us all as women. They have reminded me of who we all really are... and of who I am as a woman. The Sister Circles have brought to the forefront of my life that innate wisdom that we all have within, and have enabled me to tap into this in such an effortless and graceful way. I could never have imagined the powerful effect that participating in one of Kate's gorgeous circles was going to have on me. To have felt so lovingly heard, so safe and supported by such beautiful and nurturing women has been a life changing experience for me, and one that I hope every woman has the opportunity to experience. These Circles are crucial for us as women - they enable us to connect not only with our inner-most selves, but with the divine Sisterhood. The Sister Circles are an elixir for our souls. I am so very grateful for you Kate - and for all that you are doing for our Sisters."